Voting is underway in Copeland and Stoke as senior Labour figures voiced fears that as a “weather bomb” bringing heavy rain and gales would hit turnout. Labour campaigners have been increasingly confident of seeing off the UKIP threat in Stoke-on-Trent Central but have said the contest in Cumbria appeared too close to call. Voters awoke to the sight of Storm Doris reaching a force of up to 90mph and lashing properties in northern England, the Midlands, East Anglia, North Wales and Scotland. Jack Dromey, who is leading the campaign in Stoke, has said the seat is a “three-way marginal” while Andrew Gwynne, Labour’s new joint elections co-ordinator who is in Copeland, said the party’s performance would depend substantially on efforts to get out the vote. The weather is also expected to play a significant role with rain forecast throughout most of the day in the Potteries. In west Cumbria, one of the wettest parts of Britain. rain is forecast to clear this afternoon. The Tories had run a low-energy effort in Stoke but appeared to increase their efforts this week following the meltdown of Paul Nuttall, the UKIP leader, who is the eurosceptic party’s candidate in the seat. 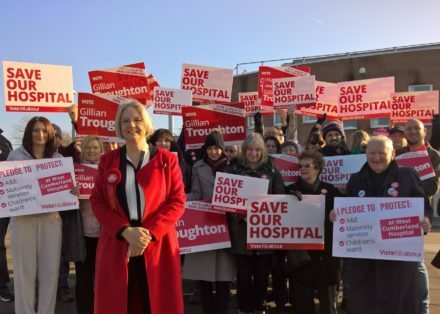 Trudy Harrison, the Tory candidate in Copeland, has fought an intense battle where she has attempted to neutralise campaigning on the threat to local maternity services by Gillian Troughton, Labour’s candidate, by highlighting her own decision to give birth to her four children in the West Cumberland hospital. Yesterday it emerged that Sir Michael Fallon, the defence secretary, has boasted that victory in Copeland is “within our grasp” when he visited the seat. “Labour support is there and our challenge is to get them out”, Gwynne told The Guardian.